Over the past 10 years, I have had the amazing fortune of working with a ton of brilliant casting directors in this industry. Personally, I have gained so much knowledge by sitting next to these amazing guests. Working with casting directors who have witnessed thousands of auditions has informed me and provided me with expertise as both a director and as a teacher. I have taught so many master classes alongside of Patrick Goodwin of Telsey + Company. He has always been so generous with actors; especially kids. Pat is so smart and has helped many of our Broadway Workshop students reach their greatest potential. He is not only a great casting director, but also such an amazing teacher. The amount of time he took with every child auditioning for the revival of Annie was truly inspiring to me. That’s a lot of listening to “Tomorrow”. Pat Goodwin has been with Telsey + Company Casting for over a decade. He has been directly involved in the casting of the Broadway productions of Waitress, Finding Neverland, Pippin, Annie, Radio City Christmas Spectacular and the Broadway bound productions of The Spongebob Musical, The Honeymooners. Telsey Casting is responsible for the casting of shows like Hamilton, Wicked, Fiddler on the Roof, The Color Purple and the upcoming Charlie and the Chocolate Factory, Anastasia and Hello Dolly and the NBC musicals The Sound of Music Live, Peter Pan Live and Hairspray Live. As we prepare to bring Pat back to Broadway Workshop for a KIDS ON BROADWAY workshop, I asked Pat to answer a few questions about the casting process. 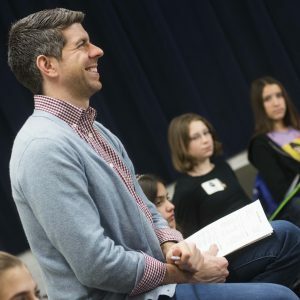 Check out “5 questions with Broadway Casting Director Patrick Goodwin,” and we hope to see you at Pat’s KIDS ON BROADWAY workshop next Sunday! 1) What is your favorite project you have worked on? It’s so hard to pick a favorite, because I’ve loved all the projects I’ve been fortunate to work on. But if I had to pick one, I think I’d have to say Waitress. I love the style of the music and the challenges of finding the right people to fit the very specific roles in the show. 2) What is the most interesting thing you have seen an open call? What I find most interesting in open calls are people who really know what their strengths and are very comfortable in their own skin. 3) What is your favorite audition song? There’s SO many, I can’t pick a favorite, but I will say that it’s very dependent on the person. What works for one person will not be a wise choice for another person because there’s so many different types that people fall under. 4) What is the biggest mistake you see from kids and parents at auditions? Not being prepared. Your preparation is the one thing you have control over in auditions, so don’t come in unprepared. Do your homework! 5) What is the biggest challenge of your job? The biggest challenge is also the biggest reward- discovering new talent by thinking outside the box and using non-traditional avenues to find new people. What was your first Broadway show? Pat Goodwin is set to teach a KID ON BROADWAY workshop on Sunday November 13th. This workshop is geared for students ages 8-13 and will take place at Ripley Grier Studios. For more information on this class CLICK HERE!